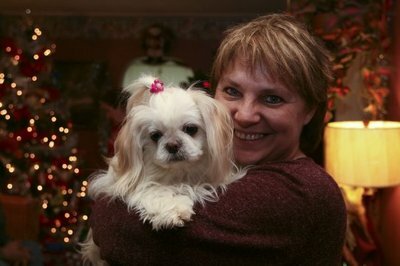 In March 2004, our male Shih Tzu Micky passed away from several health problems. It was such a heartbreaking experience for both my husband and I. Our female Shih Tzu Molly seemed to age quickly when she realized little Micky was not coming home. I had no desire to find another dog, our hearts were broken. When people asked if we were planning on getting another dog, I replied ONLY if I could find a white shih tzu (since I had never seen any white shih tzus, I never expected to get one). Two months later my son, who drives a delivery truck, mentioned a family he met on his route, who were expecting a new litter of puppies, and the parents had white fur. I was curious and gave this family a call. They invited us to see the puppies soon after they were born. When the puppies were 10 days old, we went for a visit to see them. I was stunned to see so many white puppies! I decided to take the smallest baby. The owner suggested we wait until they were a little older as the color of their fur changes as they get bigger. So we waited. When we returned to see the babies when they were a month old, my heart changed. For 20 minutes, I held each puppy over and over and one little girl just fell into my hand like she was meant to be there. She melted my heart right then and there. When we picked her up, she was 8 weeks old. As we walked into the kitchen we saw a little white fluff ball scooting across the floor. As soon as I picked her up, I knew she chose me. For the past 5 years, my little Maggie Mae continues to melt my heart every day. Her big brown eyes, the cute little ways she gets my attention, her “attitude” when a bike rides by and her perky personality….I treasure every minute with her. She still loves to cuddle and be pampered, just like the very first day.